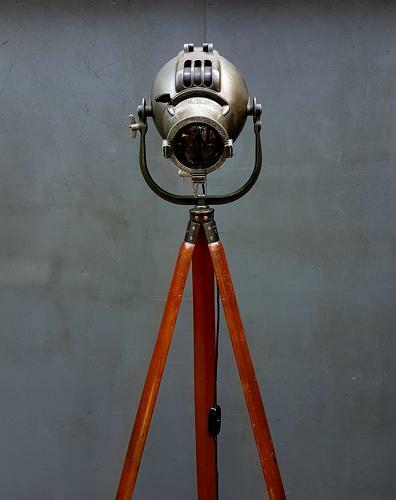 An original vintage Strand theatre lamp mounted on a solid mahogany tripod. A fantastic, well balanced pairing with both the lamp & tripod boasting an excellent colour & patina. The 'Patt 23' lamp by The Strand Electric Company comes in its original olive green paint which has a great amount of wear and is finished with original stencilled lettering & numbers to the rear. It retains its original magnifying lens & inner reflectors & comes wired in a generous length of twisted black flex with an inline switch. The mahogany tripod is of the highest quality with thick tapered legs, metal feet & a cast brass top section. A fantastic set up which makes a wonderful statement piece! Wear commensureate with age as pictured, excellent overall, one small chip to the glass lens which does not detract. The lamp has been converted to accept regular bayonet cap household bulbs & we would recommend using a low power bulb. UK courier service available at £45 tracked & signed for 24 hour delivery. The lamp & tripod will be dispatched separately & will require a very basic assembly (one nut & bolt).